One of the most crucial part of a particle system is the container for all particles. It has to hold all the data that describe particles, it should be easy to extend and fast enough. In this post I will write about choices, problems and possible solutions for such container. Actually one could say that it is OK. And for some simple cases indeed it is. Are we OK with SRP principle here? What if we would like to add one field to the particle? Or have one particle system with pos/col and other with pos/col/rotations/size ? Is our structure capable of such configuration? What if we would like to implement new update method? 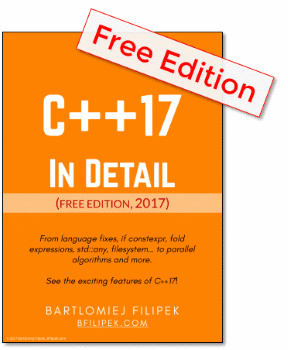 Should we implement it in some derived class? It looks like SRP is violated here. The Particle class is responsible not only for holding the data but also performs updates, generations and rendering. Maybe it would be better to have one configurable class for storing the data, some other systems/modules for its update and other for rendering? I think that this option is much better designed. Having Particle class built that way we are blocked from possibility to add new properties dynamically. The problem is that we use here AoS (Array of Structs) pattern rather that SoA (Structure of Arrays). In SoA when you want to have one more particle property you simply create/add new array. As I mentioned in the first point: we are violating SRP so it is better to have a separate system for updates and rendering. For simple particle systems our original solution will work, but when you want some modularity/flexibility/usability then it will not be good. AoS pattern might hurt performance. In the update code for each particle we have not only the computation code, but also a (virtual) function call. We will not see almost any difference for a 100 particles, but when we aim for 100k or more it will be visible for sure. The same problem goes for rendering. We cannot render each particle on its own, we need to batch them in a vertex buffer and make as few draw calls as possible. All of above problems must be addressed in the design phase. How to do it efficiently? It looks like particles need a dynamic data structure - we would like to dynamically add and delete particles. Of course we could use list or std::vector and change it every time, but would that be efficient? Is it good to reallocate memory often (each time we create a particle)? One thing that we can initially assume is that we can allocate one huge buffer that will contain maximum number of particles. That way we do not need to have memory reallocations all the time. We solved one problem: often buffer reallocations, but on the other hand we now face a problem with fragmentation. Some particles are alive and some of them are not. So how to manage them in one single buffer? Use alive flag and in the for loop update/render only active particles. this unfortunately causes another problem with rendering because there we need to have a continuous buffer of things to render. We cannot easily check if a particle is alive or not. To solve this we could, for instance, create another buffer and copy alive particles to it every time before rendering. 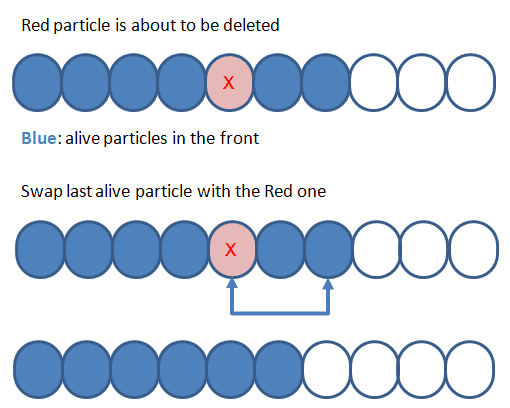 Dynamically move killed particles to the end so that the front of the buffer contains only alive particles. As you can see in the above picture when we decide that a particle needs to be killed we swap it with the last active one. When we update particles there is no need to check if it is alive. We update only the front of the buffer. In the article I've introduced several problems we can face when designing a particle container. Next time I will show my implementation of the system and how I solved described problems. BTW: do you see any more problems with the design? Please share your opinions in the comments.